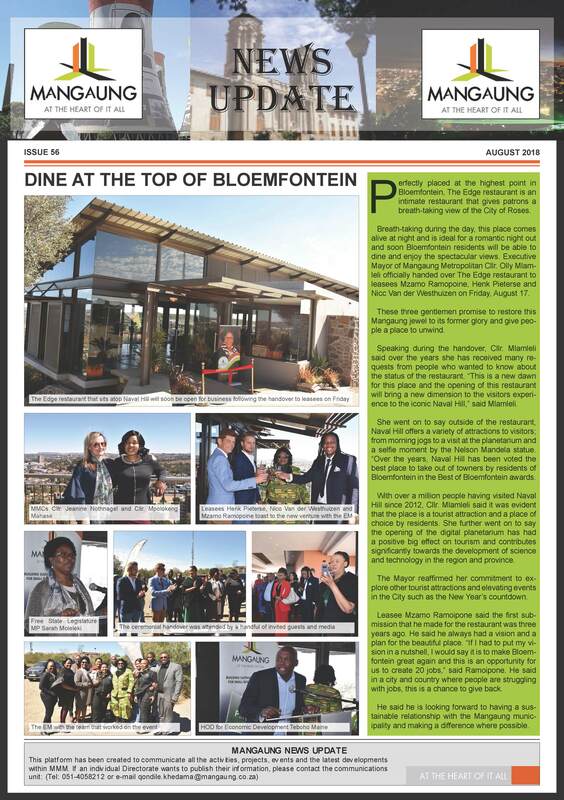 Perfectly placed at the highest point in Bloemfontein, The Edge restaurant is an intimate restaurant that gives patrons a breath-taking view of the City of Roses. Breath-taking during the day, this place comes alive at night and is ideal for a romantic night out and soon Bloemfontein residents will be able to dine and enjoy the spectacular views. Executive Mayor of Mangaung Metropolitan Cllr. Olly Mlamleli officially handed over The Edge restaurant to leasees Mzamo Ramopoine, Henk Pieterse and Nicc Van der Westhuizen on Friday, August 17.